AKA Albert Arnold Gore, Jr. It is often falsely stated that Al Gore took credit for inventing the Internet. He did claim credit for the "initiative in creating the Internet", which is an unfortunate choice of words and arguably an overstatement, but Gore did play a key role in funding the early commercial Internet. From the transcript of his interview with Wolf Blitzer, CNN Late Edition, 9 March 1999: "During my service in the United States Congress, I took the initiative in creating the Internet. I took the initiative in moving forward a whole range of initiatives that have proven to be important to our country's economic growth and environmental protection, improvements in our educational system." 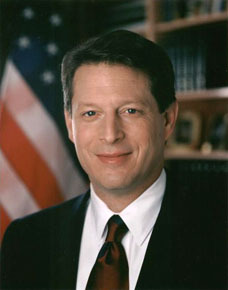 Al Gore's term in Congress was 1977 to 1985. ARPANET, predecessor to the Internet, started in 1969, and the word "Internet" entered the network argot roughly around 1974, referring to an interconnection of disparate networks. It was not until 1983 that the TCP protocol replaced the earlier NCP protocol, and the Internet remained the province of government and research until 1988, when the introduction of commercial interests brought the network into full flower. It is in this key period that Gore deserves credit. The false claim of "invention" was made by other individuals, never by Gore.